About Us | WEEKEND HANDICAP | Make your game better and prove it! Make your game better and prove it! Hello and welcome to the Weekend Handicap. We are a small team of passionate golfers who have developed a website we hope you agree is good for every golfer in the country. Players who are not a member of a club in New Zealand can join our virtual club to get an indication of what their handicap would be as golf club members. 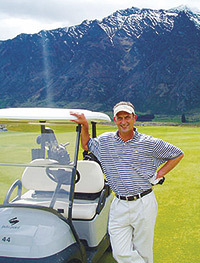 Weekend Handicap members are welcome to play at any course in New Zealand by paying the club’s non-affiliate green fee. However, we have negotiated lower week day and weekend green fees at golf clubs throughout the country and encourage you to support them. Once your round is completed you then enter your scores in on our website to receive a handicap. Use this handicap in the next corporate golf day you play in or when playing golf against your mates in your weekly haggle! We hope you take the time to look around and see the benefits that joining Weekend Handicap will give both you and your golfing mates. We look forward to seeing you join the growing number of golfers who are becoming Weekend Handicap members. Cheers from all here at the Weekend Handicap. Now make your game better and prove it!